AKRON, Ohio, January 27, 2012 (ENS) – FirstEnergy Corp. subsidiary companies will retire six older coal-fired power plants located in Ohio, Pennsylvania and Maryland by September 1, the utility announced. The decision to close the plants is based on the U.S. Environmental Protection Agency’s Mercury and Air Toxics Standards, MATS, which were finalized in December, and other environmental regulations, the utility said in a statement Thursday. 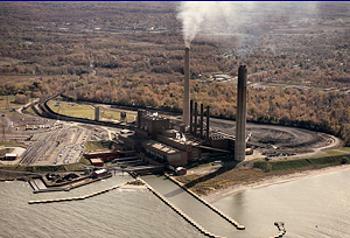 The following plants will be retired: Bay Shore Plant, Units 2-4, Oregon, Ohio; Eastlake Plant, Eastlake, Ohio; Ashtabula Plant, Ashtabula, Ohio; Lake Shore Plant, Cleveland, Ohio; Armstrong Power Station, Adrian, Pennsylvania; and R. Paul Smith Power Station, Williamsport, Maryland. The total capacity of the power plants that will be retired is 2,689 megawatts. Recently, these plants have served mostly as peaking or intermediate facilities, generating, on average, 10 percent of the electricity produced by the company over the past three years. In total, 529 employees will be directly affected. The plant retirements are subject to review for reliability impacts, if any, by PJM Interconnection, the regional transmission organization that controls the area where they are located. “Above all, this is a win for public health and for families who have been breathing polluted air from these outdated plants,” said Bruce Nilles, senior director of Sierra Club’s Beyond Coal campaign. Since 1990, FirstEnergy has reduced emissions of nitrogen oxides by more than 76 percent, sulfer dioxide by more than 86 percent and mercury by about 56 percent. When the six coal-fired plants are removed from FirstEnergy’s fleet, more than 96 percent of the power generated will come from resources that are non-emitting or low-emitting, including nuclear, hydro, pumped-storage hydro, natural gas and scrubbed coal units. Nilles views the closures as part of a national trend of clean energy replacing coal. The Mercury and Air Toxics Standards will reduce emissions of heavy metals, including mercury, arsenic, chromium, and nickel; and acid gases, including hydrochloric acid and hydrofluoric acid. These toxic air pollutants are known or suspected of causing cancer and other serious health effects. Power plants are the largest source of U.S. mercury emissions to the air. Once mercury falls from the air onto rivers, lakes and streams, microorganisms in the water can change it into methylmercury, a highly toxic form that builds up in fish. People are primarily exposed to mercury by eating contaminated fish. Methylmercury exposure is a particular concern for women of childbearing age, unborn babies, and young children because scientific studies have linked high levels of methylmercury to damage to the developing nervous system, which can impair children’s ability to think and learn. Other toxic metals emitted from power plants, such as arsenic, chromium and nickel, can cause cancer. The EPA says that reducing toxic power plant emissions will also cut sulfur dioxide and fine particle pollution, which will reduce particle concentrations in the air and prevent thousands of premature deaths and tens of thousands of heart attacks, bronchitis cases and asthma episodes. The nonprofit Clean Air Task Force calculates that closure of the six plants will prevent more than 174 premature deaths, 282 heart attacks, 2,677 asthma attacks, and 136 asthma emergency room visits.